Self Storage means we provide the space, you fill it with your goods, and then you lock it with your padlock and take the key with you. We give you an access card to operate the security gate. Our secure lockups are used for storing personal/household goods and furniture, business equipment, surplus stock, trade goods (just to name a few). 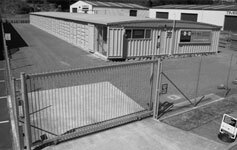 Our purpose built self storage facility is located conveniently in the Borrell Avenue industrial area in Westown, New Plymouth (location of the storage facility relative to you is an important factor as many trips can often be made). FREE friendly helpful advice as we are independently locally owned and operated. Short or long term storage available to suit your needs. We are happy to show you around our facility for your own ‘peace of mind’. Access – 7am to 7pm (8pm during daylight saving) 7 days a week just like your own garage. Our office is sometimes unattended. If you would like to have a look around our facility, please phone so we can meet at a time convenient to you. It’s as easy as making a phone call. Refer to Contact Us page.